Laser tag is a fun, team-based game where players aim futuristic-looking phasers at lights on the vests of their opponents. A painless and completely harmless radio transmission from the phaser “tags” the lights on the opponent’s vests and scores points. The team with the most tags wins the game. There are also bases located in our 3,000 square foot, multi-level arena that can be captured for points. We also have an observation deck where you can view the game! Each player can view their independent and their team score on a monitor outside the arena after the game. Groups of 10 or more receive a discount! In the arena there are several rules to insure safety and fun. We suggest that players wear closed-toed, rubber-soled shoes. You must hold the phaser with two hands in order for it to function correctly. We will have Marshalls in the arena to maintain safety and to help if there are questions. Tournament available to all ages on Thursdays with a chance to win $20 cash! 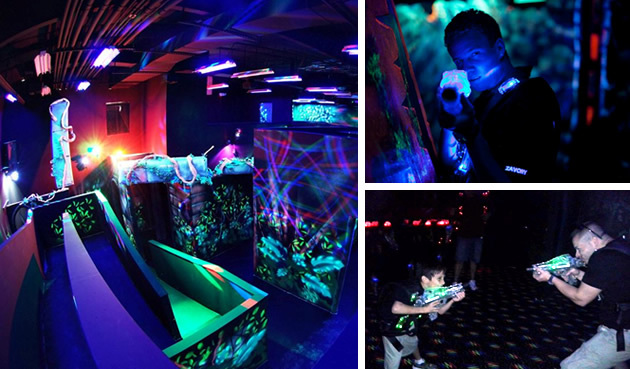 At Safari Quest, we have more than just team-versus-team games! Check out our other games styles below! Game styles are available Monday through Thursday and during our Lock-In Events.